The Holy Martyress Dorothea, together with the Martyresses Christina and Callista and the Martyr Theophilos lived in Caesarea Cappadocia and suffered under the emperor Diocletian in either the year 288 or 300. 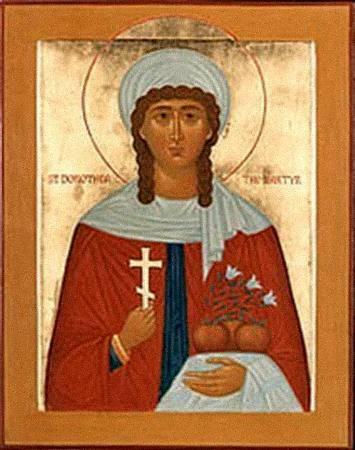 Saint Dorothea was a pious Christian maiden, distinguished by her great beauty, humility, prudence, and wisdom bestown by God, which astonished many. Arrested upon orders of the governor Saprikios, she steadfastly confessed her faith in Christ and was subjected to tortures. Failing to break the will of the saint, the governor sent to her two women, the sisters Christina and Callista, who formerly were Christians, but in fearing the tortures they abjured Christ and began to lead impious lives. He ordered them to talk Saint Dorothea into offering sacrifice to the pagan gods. But just the reverse happened: persuaded by Saint Dorothea, that the mercy of God is granted to all that repent, they repented themselves and again were converted to Christ. For this they tied them back to back and burned them in a tar barrel. The holy sisters Christina and Callista died suffering, offering up a prayer of repentance to the Lord and atoning for the sin of apostacy. Saint Dorothea was again subjected to tortures, and she very gladly endured them and accepted the death sentence. When they led the saint to execution, a certain student, (the Scholastic) Theophilos, with mockery said to her: "Bride of Christ, throw to me rose blossoms and apples from the garden of thy Bridegroom". In reply the martyress nodded to him. Before death, the saint requested time to pray. When she finished the prayer, an Angel appeared before her in the form of an handsome youth presenting her on a pure linen cloth three apples and three rose blossoms. The saint requested all these be handed over to Theophilos, after which she was beheaded by the sword. Having received the gracious gift, the recent mocker of Christians was shaken, and he believed in the Saviour and confessed himself a Christian. Subjected to cruel tortures because of this, Saint Theophilos accepted a martyr's death through beheading by the sword. The relics of Saint Dorothea are located at Rome in a church in her name, and her head likewise is at Rome, in a church of the Mother of God at Trastevero.